Personally, I think the Macintosh is a wonderful machine. I use one daily at work, and then at night I play with the one I have at home. Or, at least, I try to play with it. You see, my wife—who for years resisted all my attempts to introduce her to computers—has fallen in love with the Mac (her words, not mine). She uses it to type up medical reports, notes on her clients, and personal letters. In fact, she’s suggested that we get a second Macintosh so that we won’t have to fight over the one we have. If you find you have reached 5 authorizations due to system upgrades, you can reset your authorization count by clicking Deauthorize All in the Account Information screen. Note: You may only use this feature once per year. The Deauthorize All button will not appear if you have less than 5 authorized computers or if you have used this option within the last 12 months. Would “See any TV show you want to, anytime you want to see it” or “build a library” count as enough obvious encouragement of librarying—which was not found to be fair use—to justify a finding of contributory infringement?…What about “any TV show” in the context of pay cable, which again was not analyzed as fair use when the Court looked at time-shifting free broadcast TV? Moving onward, what would a responsible lawyer tell Apple about “Rip. Mix. Burn.” after today? Does that clearly promote infringement? RSS support in web browsers is a good idea. There’s plenty of room for developers to come up with interesting and innovative ways to do it. OmniWeb and FireFox have had genuinely different interpretations of what it means to put RSS/Atom in a web browser. But as far as I can tell (I’m not going to install a WMV player to watch the demo) MS has just done a copy-and-paste of what we did. I guess my co-workers and I are supposed to feel flattered by this? Wil Shipley gave a hilarious talk at WWDC about being a small Mac developer, and now he’s posted his thoughts about piracy. Google Guide has a nice search syntax cheat sheet (via David Pogue). Joel Spolsky has compiled a book of essays on software, which he calls The Best Software Writing I. He released the chapter listing in June 2005, and I noticed that a lot of them were blog posts that I’d read before. I wondered how much of the book was taken from online content. A few minutes of hacking later, and a programmed equivalent of Google’s “I’m Feeling Lucky” had found every single chapter. DropDMG 2.6.1 adds support for bzip2-compressed disk images, adds a “Mount Image (with Owners)” command, and includes various optimizations, tweaks, localization updates, and bug fixes. Brent was robbed. I think the problem is that NNW2 is too good. It just disappears. Obviously he needs some animated, throbbing spinning globe Dashboard dealie. Gag. NetNewsWire 2 would have been my pick for Best Mac OS X User Experience. But, then, if I were running the awards, BBEdit would have won at some point, too. These are apps that were designed to be used. They’re loved by techies as well as real people. And they really sweat the details. So in Xcode they use this grey area at the bottom of each window, and for me it really reminds me of the Safari status bar, so much so that I constantly try to drag the window by clicking in its area. But then, after it doesn’t work, I remember it’s not a metal window. It’s the grey that fools me I think. I’ve done this, too. Other reinforcement: the Finder status bar is draggable only when it’s at the bottom of the window. Sven-S. Porst has a lot of interesting comments about Spotlight, and a good point about the names of items in the Library folder. Mac OS X Hints shows that with 10.4 you can create an on run argv AppleScript handler to retrieve extra arguments that are passed to osascript. It sounds like Universal Binaries won’t really be universal. The programming guidelines strongly suggest that GCC 4 is required to build Universal Binaries. However, applications compiled with Xcode and GCC 4 only run on Mac OS X 10.3.9 and later (if C++ is used) or 10.3 and later (if plain C is used). Will developers have to ship two separate .app files? There are still lots of Panther, and even Jaguar users. Also, how will Intel’s compilers (which are apparently much better than GCC) factor in? Dave Hyatt reports that WebKit is now open-source, with CVS access. It looks to be a BSD-style license. Using Intel’s mobile processors for laptops does seem to make sense. Existing native applications will be supported. Most of the rumors didn’t mention this, but it’s obviously a requirement. What’s Rosetta’s estimated performance? Will Classic be supported? Unbelievably, the keynote coverage I’ve read thus far indicates that Jobs did not answer these questions. What can Apple do about one of the problems that plagued OS/2: reluctance to develop native applications because Windows applications will be able to run at full speed? Most importantly: Apple depends on hardware revenue. How will they be able to compete with Dell, et. al., when they almost went bankrupt competing with Power Computing? Switching business models is much harder than switching processors, and there’s been no indication of how Apple will manage the former. The ADC site is still down for maintenance, so I don’t know what the Developer Transition Kit contains. 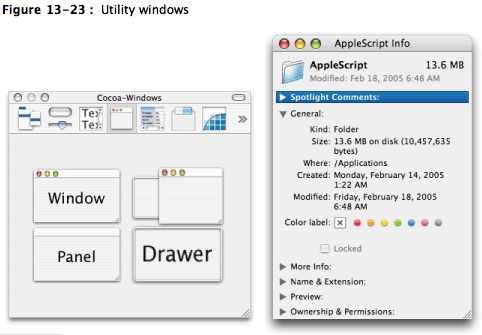 A user can open several utility windows at a time; they float on top of document windows. When a user makes a document active, all of the application’s utility windows should be brought to the front, regardless of which document was active when the user opened the utility window. When your application is inactive, its utility windows should be hidden. Utility windows should not be listed in the Window menu as documents, but you may put commands to show or hide all utility windows in the Window menu. A user would never need to minimize a utility window because it is displayed only when needed and disappears when its application is inactive. Therefore, the minimize button is always unavailable. I was actually looking at the HIG to see if it had anything to say about the new “Unified title/toolbar look” option in Tiger, but I couldn’t find anything. iCab 3 is now available as a public beta. Brent Simmons offers a peek into the NetNewsWire development process. I much prefer the design he ended up shipping. Mac Office 12 will support the new file formats as well. Also, as with Win Office, we'll be producing converters for Office X and Office 2004.…For us in Mac BU, this represents an enormous undertaking on two fronts. Win Office is already well ahead of Mac Office in terms of support for XML, and the state of XML parsing on Panther is, well, less than desirable (among other things, the version of libXML that ships on Panther doesn't support SAX 2.0's namespace changes). Jesse Grosjean at Hog Bay is working on an open-source, Eclipse-inspired framework for Objective-C plug-ins.